To be the first Mexican anything in boxing is impressive, and Cristobal Arreola has a chance to do that tomorrow night in front of a basically hometown crowd at the Staples Center in Los Angeles, California, one of the best places to see a fight bar none. Not to mention the fact that it is HBO's lone televised bout tomorrow night, and it is being featured with a replay of Floyd Mayweather, Jr.'s dismantling of Juan Manuel Marquez that met a reported one million pay-per-view buys last weekend. 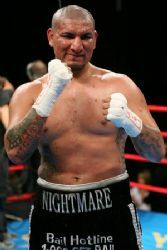 Arreola is going to receive the ultimate exposure, and if he is somehow able to pull off the upset [Arreola is at least a 4:1 underdog most places], he would become the first heavyweight of Mexican descent to claim a piece of the heavyweight championship of the world, which was at one point the most prestigious championship in all of sports. Most fans are hoping Arreola pulls off the upset; it would mean a big change in the heavyweight title picture and would open up a window to a series [yes, plural] of potential exciting fights in the division that would also put a lot on the line. If Arreola wins, fights could be made with David Haye, who is fighting WBA champion Nicolay Valuev later this year, in a potential unification fight. A fight could be made in-house against Eddie Chambers, who, like Arreola, is promoted by Goossen-Tutor Promotions. Chambers may be fighting for a world title in 2010 also. If Vitali Klitschko [yes, this is the first time his name is mentioned in three paragraphs discussing a fighter that is challenging for Klitschko's title] wins, much will stay the same in the division. And anytime something terrible is left stagnant, a fouler smell is produced. The heavyweight division is long past due, and nothing but a shot of youth could fix that. Now what are Arreola's chances tomorrow night? I would say the oddsmakers are about right. Arreola will be in a big fight for the first time in his career, how exactly will he respond? He was knocked down in a fight against Travis Walker [I know, not exactly world-class] in a stadium just a few blocks from where he grew up, but he was able to get up, dust himself off, and hurt his opponent and floor him twice to setup a third-round knockout. One problem with this is that Vitali has never been visibly buzzed in a fight [that I've seen at least] and his only loss are fights that he was giving a good account of himself in. On top of that, Klitschko's jab is one of the most difficult to get away from in the sport. This fight could very well be Klitschko jabbing Arreola to death, possibly stopping him on cuts or multiple knockdowns. If Arreola doesn't see the big right hand coming, it could be over early. Arreola's best chances likely lie in the early rounds as well, where he could hope to catch Klitschko off-guard with his surprisingly quick combination punching that nobody in the division has been able to handle yet. The jury is still out on whether Arreola came in the best shape possible as well as how prepared he is to go eight or more rounds if it becomes that kind of fight. We haven't really seen Arreola have to deal with that yet, it could be a key factor in the fight. If Arreola pulls off the upset, it would definitely become an event worth remembering, and one that helps build towards other memorable moments.